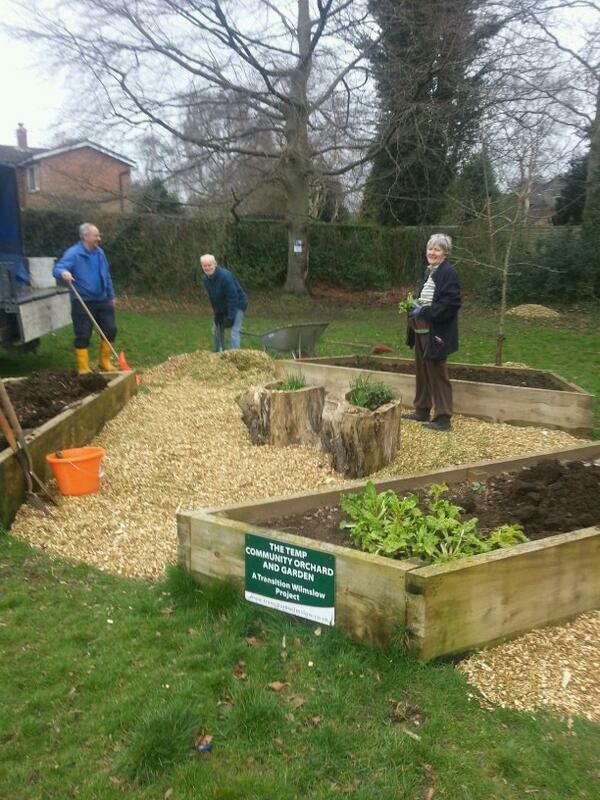 Transition Wilmslow Food Group has been fortunate enough to be given the opportunity to create a community garden at ‘The Temp’ on Gravel Lane, Wilmslow where we had already established an orchard. We hope to enthuse the local community with the pleasures of growing their own produce. A grant funded by the Tudor Trust via Community Futures and donations from the Yorkshire Building Society coupled with private donations gave us enough money to make a start to the project in 2012. Much has happened since!! See below for updates. We had a lovely afternoon in the sunshine spreading our own compost on the raised beds, ready for planting. We were very pleased to have help from some local children who watered and helped push the wheelbarrows! Regular meet-ups start on Tuesday 16 April at 7pm and thereafter every Tuesday till the autumn. Do join us! We have groups of Brownies, Beavers and Guides joining us over the summer. 2018 has been a year of expansion, sunshine and happy community endeavour in our garden at The Temp. We secured nearly £2000 from Cheshire East and Manchester Airport community funds which we spent on materials to make and plant up six new raised beds. We had lots of help from TW members and others to build the boxes, shovel manure and soil, plant vegetables and herbs and spread wood chippings to keep weeds down. We were really pleased to welcome a teenage group from the National Citizen Service on one unusually rainy weekday morning: they moved a mountain of chippings. The amazing hot summer meant watering was a challenge. Our water butts in the hedge greatly helped, and we took it in turns to bring water down to the garden every Tuesday evening during the driest spells. Individual boxes were adopted by groups of Beavers and Brownies as well as Year 6 from Lindow School. They all enjoyed afternoon sessions at the garden, planting, weeding and watering, playing games – and then harvesting at the end of the summer. The big potato cook-in is always a favourite. We put up signs welcoming people to the garden on Tuesday evenings to help with regular maintenance and harvesting. Plans for next year include raising money for three more boxes to fill in the gap, and further sustained outreach work with local groups and schools. Thanks to all our helpers for their hard work in a very busy year. Recently we’ve added six new beds, bringing the total to fifteen. This expansion has been part-funded by Manchester Airport Community Trust Fund and Cheshire East Community Grant fund. We’ve match-funded with many hours of volunteer labour including from Scouts and Guides: 5th Wilmslow Beavers and 7th Wilmlsow Brownies have each adopted beds to plant up, weed, water and harvest. We’d love more people to get involved with the community garden. It’s there for everyone! Regular meet-ups are 7pm every Tuesday evening – bring a few tools along if you have them. All ages are welcome and the produce is for everyone. The Temp is a small quiet park, much loved by locals, that forms a link between Gravel Lane and Eden Close. It’s a great place for families to picnic and play. Having recently received a grant of £1,450 from the Airport Community Trust Fund there have been two working parties building six new raised beds and filling them with manure and topsoil. Thanks to Chris Frankland and his staff for working hard to prepare and deliver all materials. 7th Wilmslow Brownies had a productive evening planting vegetables in two of the old beds and 5th Wilmslow Beavers have planted up three of the new beds. Our new water butts came into their own with many watering cans being carted! There is still lots to do, including moving excess manure onto the compost heap in the corner of the park and planting up five beds which remain empty. Of course there is always ongoing maintenance as well. With this in mind …. We have ended up on a high note – gaining a Level Four award in the ‘It’s Your Neighbourhood’ scheme of North West RHS Britain in Bloom! So, here’s what we’ve been doing – with our future plans too! This year our Food Group has concentrated its efforts on developing the community garden in The Temp, Gravel Lane. 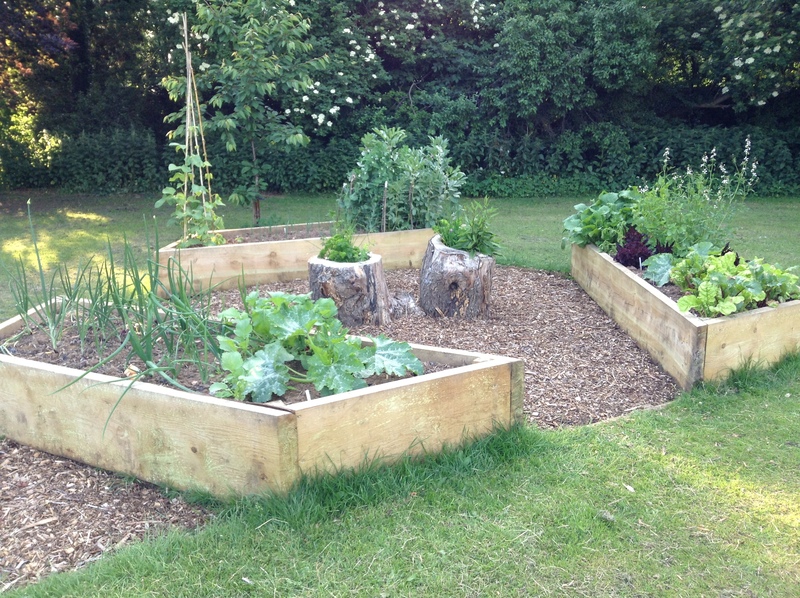 The number of raised beds for vegetables has been increased enabling the group to engage local troupes of Guides, Brownies, Beavers and Rainbows to adopt beds and to be taught about gardening. A working party is planned for Saturday 18th, November at 10 am when some crops suitable for Winter will be planted along with a damson tree and soft fruit bushes. Anyone interested in helping is very welcome. Previous experience shows that, not only do many hands make light work, but these occasions are sociable and fun. Other plans for the Winter include adding even more raised beds to the space available and trying to establish a water supply on the site. This will largely depend on funding and any ideas on available funds would be welcome. The group is keen to foster relations with Incredible Edible who have the same aims and concentrate their efforts on plantings in the town centre. They meet on the first Sunday of every month at 2 pm at the raised beds in Sainsburys car park. Anyone who wants to join them would be very welcome. Transition Wilmslow have two other orchards. The one in Meriton Road Park in Handforth is thriving but occasionally needs tending. The other was planted in conjunction with Incredible Edible and Friends of the Carrs in the Carrs. That needs attention and a date will be planned for action. Watch this space. It was a lovely sunny warm day so we were lucky. The soil was perfect. Chris showed us how to prune fruit trees. Garry planted a bed of garlic. John a bed of herbs, Pauline and Maddy a strawberry bed. Others planted fruit trees and bushes (damson and raspberries) around the fences. There were big numbers of worms popping up! All the borders were worked over with leaf mould. Looking forward to reaping the benefits next year! Recently 5th Wilmslow Beavers have enjoyed two sessions harvesting vegetables that they planted in the Spring. This took place in Transition Wilmslow’s community garden in the park known as The Temp, Gravel Lane. The first session saw the boys digging up the first of their new potatoes. “Cooks” were appointed from the group and, while the rest played rounders, the potatoes were boiled over a log fire. Everyone was able to taste their produce before going home. The photos show Beavers digging up their potatoes and then cooking them. The second session was to harvest the rest of the crop, about 10 kg, and 60 to 80 carrots; all of which was distributed among the group. This experience of following the process of growing your own has been a marvellous experience for the children. “We chose a corner of the park with a wonderful microclimate – south facing and sheltered by the trees and tall hedges behind. It’s ideal for growing vegetables but also for butterflies! Some butterflies were basking on the bark litter (Red Admiral, Small Tortoiseshell, Comma), others were feeding on our plants (Holly Blue on Runner Bean flowers) or thinking about egg laying (!) (Small White). Others were defending territories around the edges of the Temp (Speckled Wood and Small Heath). The Community Garden looked lovely for the judges when they visited. They were apparently impressed by the number of children who have helped with the garden and by the quality of our apples! Thank you to everyone who has helped with the garden this year. A small group of volunteers from Transition Wilmslow worked hard to build six more raised beds in the community garden at The Temp, Gravel lane. The work was made possible by a massive contribution from Frankland Tree Services who delivered timber, tools, fittings, top soil and woodchip which was spread around the beds to inhibit weeds. The beds are arranged in a pattern amongst the apple trees that form a small orchard and it was pleasing to note that the three new trees planted two weeks earlier are doing very well. We were at ‘The Temp’ orchard and community garden at Gravel Lane, Wilmslow to replace three damaged apple trees. Chris talked us through the whole process; how deep to dig the holes; where to place the support stakes, how high to build up the surrounding soil. It was also a good opportunity to discuss the position of the additional raised beds that will soon be built in between the trees. We went along to the Community Garden at The Temp this evening. There was some produce to harvest – runner beans, cabbages, potatoes and lettuce. The nasturtiums had nearly taken over one of the beds, but we left them to keep flowering. A few nearby residents have enjoyed picking the herbs. All the apples have gone. Unfortunately two fruit trees have been destroyed and one is struggling to grow – all due to vandalism. We would like to reach out to more people in the local area – particularly young families, so if you know of anyone who might be interested do let us know via transitionwilmslow@gmail.com. Our community garden is included in ‘Wilmslow in Bloom’ for the first time. The theme this year is ‘Butterflies and Bees’. We will be planting up our raised beds and hosting our annual veggie seedling swap event at the community vegetable garden beside the orchard at ‘The Temp’ recreation ground on Gravel Lane, Wilmslow, SK9 6LT (between Cottage Grove & Beechfield Avenue). As well as an opportunity to swap surplus seedlings there will be stalls, refreshments and activities suitable for all the family. 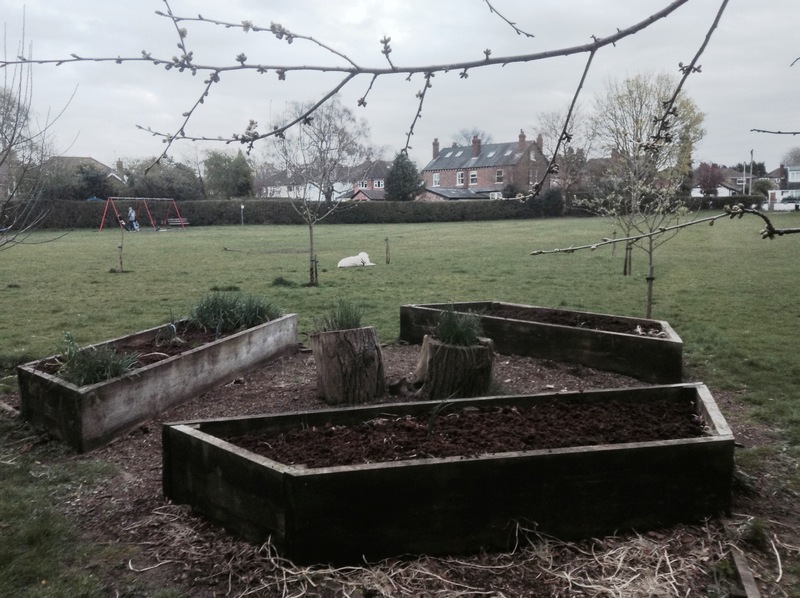 The raised beds are ready – Come and join in the fun! The Community Garden was opened in April at The Temp Park in Gravel Lane with a seed and seedling swap party that coincided with WTC officially opening the new swings. Alongside our Orchard there are now raised beds that have had a very productive season. 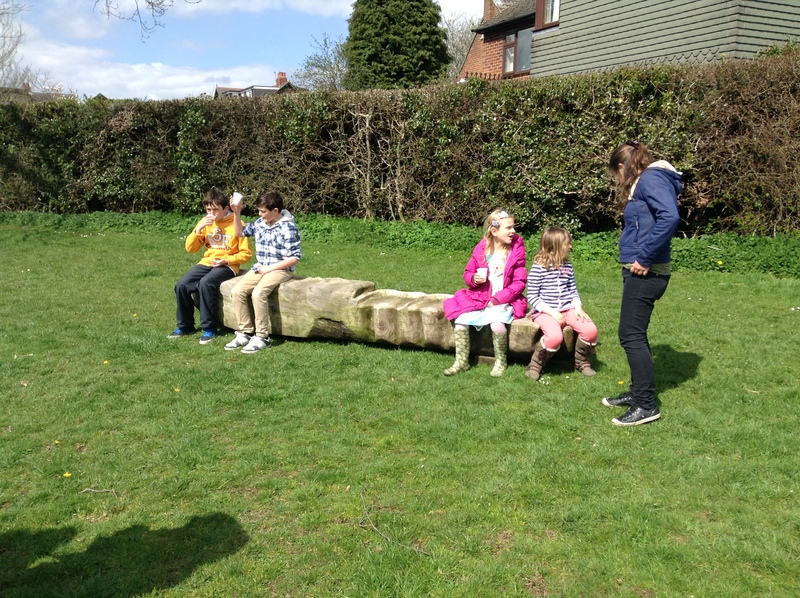 Also at the Temp there has been much interest in a fabulous “bottoms bench” made by Frankland Tree Services from a whole tree trunk with different sized seats for different sized bottoms! We widened our involvement in the community by helping the residents and staff of Lime Tree Court Hostel in Colshaw to build raised beds in their back garden so that they could start growing their own vegetables. 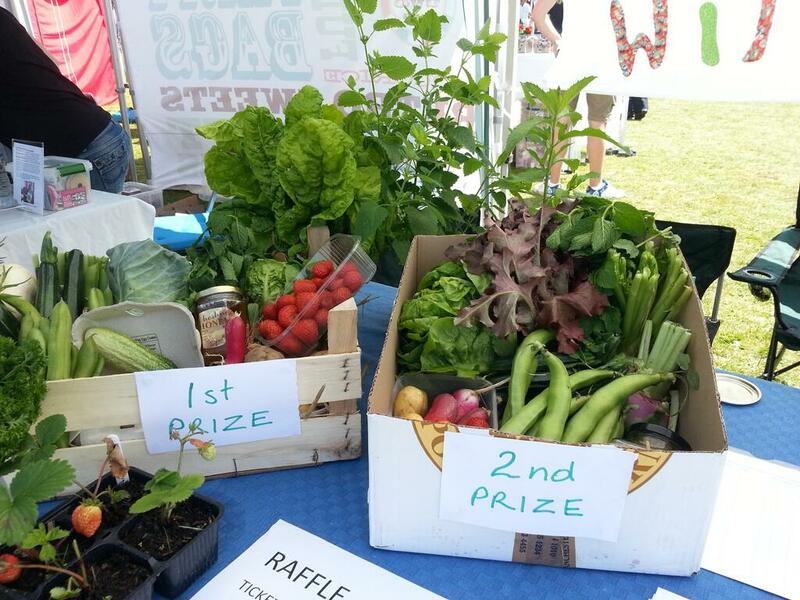 Successful stalls were held at both at the Wilmslow Show in July and at the Wilmslow Artisan Market in September promoting the work of the Food Group with fabulous Community Garden hampers for raffles. Our first outdoor meeting at the Community Garden. Seeds and seedlings planted at the Garden Launch are thriving. More planting of beans, radishes and basil. Gravel Lane, Wilmslow at ‘The Temp’ Park between Cottage Grove and Beechfield Ave.
On a beautiful crisp sunny Saturday morning volunteers from Transition Wilmslow, led by Chris Frankland and Garry Olson, got stuck in and completed the first three raised beds of the Community Garden in Gravel Lane Park. These are set within the orchard that was planted in 2011. The trees that provided the wood for the raised beds came from felled Corsican Pines from the Unitarian Chapel in Hale Barns. The wood was cut to size and treated at Chris’s workshop before being transported to the garden site and assembled. 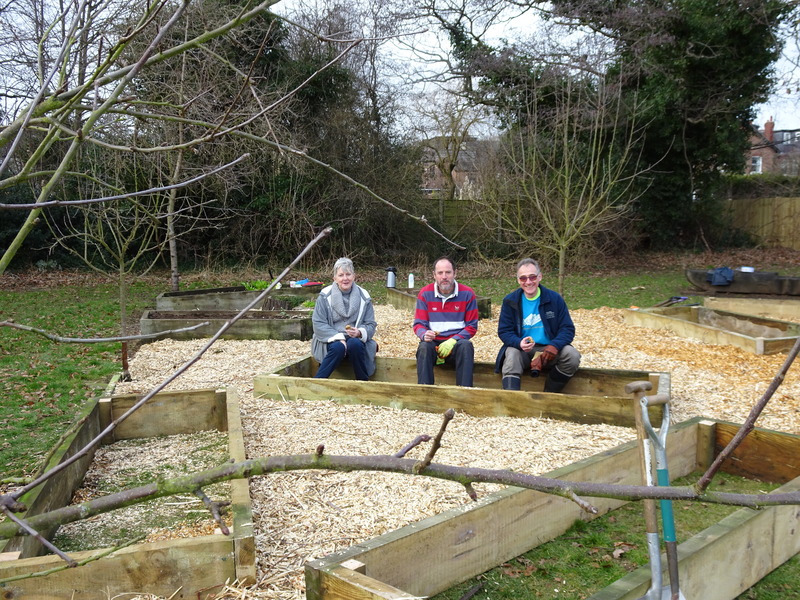 Some serious digging and wood chip spreading kept the volunteers occupied all morning. The next task is to obtain compost to add to the soil during the winter and to build some compost bins so that next year we have a ready supply of our own. In the spring we will be planting out our first vegetables. We hope that local people will come along and get involved and then later in the summer be able to enjoy the harvest.